I love the Brighton Lanes. You just never know what's going to pop up from one week to the next. 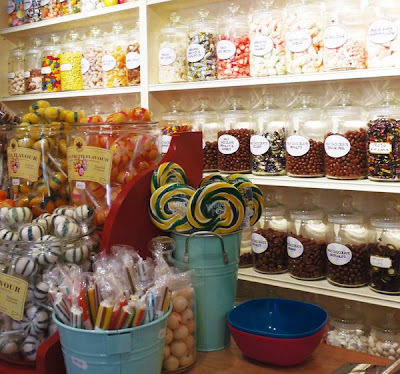 Having a secret sweet tooth I was really happy to see this shop, together with a chap behind the till wearing a candy-striped apron. If they don't have your childhood favorites here amongst the walls of jars, no one will. I got myself some cough candy, humbugs, pear drops and my absolute favorite... rhubarb and custard sweets. They even sell sugar free and vegan versions of the classics. Just what the country needs right now - somewhere to get a little treat that is easy on the pocket.